The Iwata-Medea Eclipse HP CS is a gravity feed airbrush. It comes with a 5 years warranty against manufacturing defects. It has a rather large 1/3 oz (9ml) cup size and a 0.35mm needle, a nozzle cap and drop-in self-centering nozzle combination. There is also the possibility to have an optional set up with a .5mm configuration. Note that you will need to replace all parts (nozzle, nozzle cap, and needle).The cup itself has a new funnel shape that make it easier to clean. This is an airbrush ideal for fine detail spraying but also for medium size patterns. The Iwata-Medea Eclipse HP CS comes in a box containing the brush itself, a tube of Iwata Super Lube and a spanner. The Spanner will be used the take off the nozzle cap. The brush itself feels quite heavy in the hands, a good weight though and I find it very well balanced overall. I personally like to feel some weight in my hand when I am airbrushing. As stated above the Airbrush comes with a 0.35 mm nozzle that will allow you to spray very fine details. Of course you also have the choice to go for the bigger .50 nozzle. Might be an easier choice for beginner as thinning won’t be as critical as with the 0.35 nozzle. The cup is a rather large 1/3 oz sized cup that comes with a lid that will help stopping the paint coming out of it when spraying. Quite useful. Most issues you are going to come across when airbrushing will come from not cleaning the airbrush properly or not assembling the airbrush, especially the needle, properly after the cleaning process. But thankfully, taking apart the Iwata-Medea Eclipse HP CS is very easy. All you need to do is first unscrew the handle (19) from the body and loosen the needle chucking nut (18). Then you will be able to pull away the needle (17). You will be able the clean the needle with the appropriate cleaner. Over all, it comes apart quite easily really. Needle are made from hardened stainless steel that will last ages but their fine tip can be subject to physical damage. Make sure to straighten a bent needle before putting it through the nozzle or you will damage the nozzle. Nozzle are fragile part that can be expensive to replace. Another part, along with the cup, that you will need to keep clean is the nozzle. For that you just need to unscrew the head cap (3). You should then have access to the nozzle. The Iwata Eclipse HP CS is really a lifetime airbrush. It is a high quality product like all the IWATA airbrushes. As I mention earlier, it has a nice weight in your hand, and for me, it feels just right. It will last you for years, and if you have an issue with a part, you can order it from IWATA without problem (see parts list just above). As I said in my introduction, the Iwata Eclipse HP CS comes with a 0.35mm needle. You will get really nice fine lines with this airbrush with this configuration, allowing you to paint nice detailed work. But you will be also able to cover large area very quickly with Iwata-Medea Eclipse HP CS. The Iwata Eclipse HP CS is a real workhorse, great for base-coating, varnish, shading or highlighting work. I love the cut-away handle feature that will allow you to clear any clogs quickly. There is also the possibility to have an optional set up with a .5mm configuration which would be, I think, perfect combination for a beginner. Either way, I would highly recommend the Iwata Eclipse HP CS, it is really a great airbrush. It will last you for ages and you will be able to use for all sort of projects. 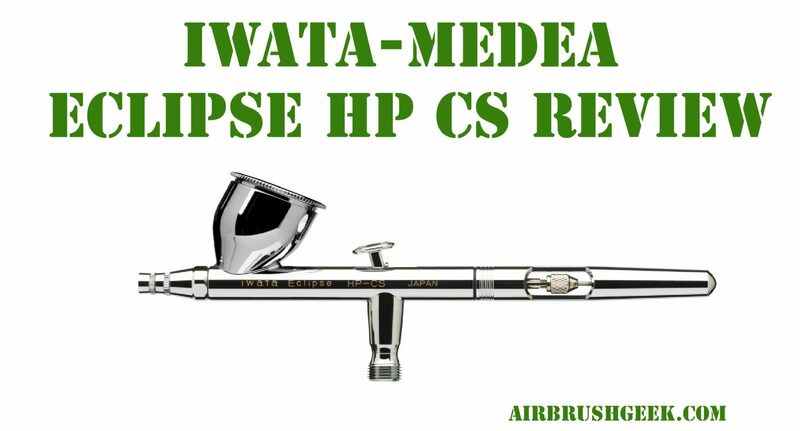 - The Iwata Eclipse HP CS is really a lifetime airbrush. - It has a cut away-handle that make it easier to clear clogs. Please let me know how YOU like the Iwata Eclipse HP CS and leave your rating below. Thanks!! Thanks Airbrushgeek for this review. I have since bought the Eclipse and I am not desappointed!